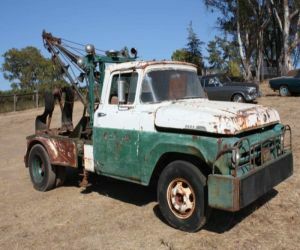 This 1957 Ford F350 tow truck is selling for $1,000. This truck does not appear to be in the best of conditions. This has got paint peeling off of it. There is rust all over the body and tow lift. The inside of this tow truck could definitely use a good bath. The seating is covered in dust and debris. The upholstery is all tore up and you can not even see what color it really is. There is a great deal of rust on the floor. All of the paint inside is either gone or close to gone. This truck needs to be disassembled and repainted, plus sand blasted so this guy can have a new coat of paint put on. This truck has 2 booms on it. This is used to lift heavy objects with. The paint on the outside of this vehicle is all rusted up and falling off. The windows on this are still in tack though. Same with the head lights they are still all in one piece. The tow part of the truck is not in good condition I wold not trust it if i had to tow a car with this. The chains and rope are rusting away.